Astronaut photograph ISS027-E-9564 was acquired on March 31, 2011, with a Nikon D2Xs digital camera using a 400 mm lens, and is provided by the ISS Crew Earth Observations experiment and Image Science & Analysis Laboratory, Johnson Space Center. The image was taken by the Expedition 27 crew. The image has been cropped and enhanced to improve contrast. Lens artifacts have been removed. The International Space Station Program supports the laboratory as part of the ISS National Lab to help astronauts take pictures of Earth that will be of the greatest value to scientists and the public, and to make those images freely available on the Internet. Additional images taken by astronauts and cosmonauts can be viewed at the NASA/JSC Gateway to Astronaut Photography of Earth. Caption by William L. Stefanov, NASA-JSC. The Shebelle River has its headwaters in the Ethiopian Highlands and transports water and sediment 1,000 kilometers (621 miles) to the southeast across Ethiopia, before continuing an additional 130 kilometers (80 miles) into Somalia. The river supports limited agricultural development within the arid to semi-arid Ogaden Plateau of southeastern Ethiopia. This astronaut photograph illustrates a network of irrigation canals and fields located approximately 42 kilometers (26 miles) to the west-northwest of the city of Gode. Floodplain sediments and soils are dark brown to gray (image center), and contrast with the reddish rocks and soils on the adjacent plateau. Vegetation in the flood plain (image top center) and agricultural fields is dark green. 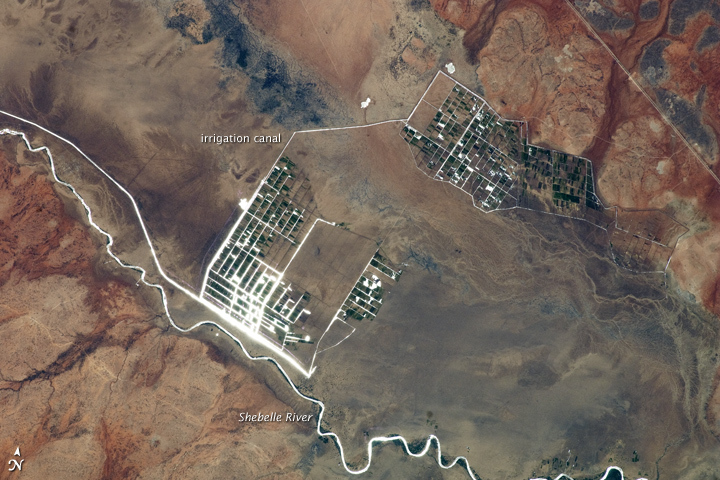 Water in the Shebelle River and the irrigation canals has a bright, mirror-like appearance due to sunglint, or light reflecting off the water surface back toward the International Space Station. The river water supports a variety of crops—the most common being sorghum and maize—as well as grazing for livestock (cattle, sheep, goats, and camels). The Shebelle River does not reach the Indian Ocean during most years, but disappears into the sands near the coast in Somalia. During periods of heavy rainfall and flooding however, the Shebelle can reach the Indian Ocean.